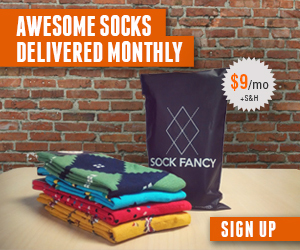 We’ve explored all the different fun sock subscriptions here on SockClubs. One online sock store stands out as having top notch whimsical sock designs, and that sock site is Bird Dog Bay. You can buy socks online at Bird Dog Bay from a handful of styles including whimsical socks and traditional socks. You can also subscribe to the Bird Dog Bay sock of the month club. Bird Dog Bay has a large selection of themes for their sock designs. Americana, Animals, Collegiate, Dogs, Equestrian, Golf socks, and many more. They also have holiday socks for the upcoming seasons. The Bird Dog Bay sock of the month club is a monthly sock subscription that costs $215. Each month, you get a new pair of socks for an entire year. Sign up for the Bird Dog Bay sock of the month club here and get free shipping on any order of over $100.